If the purest water is meltwater from glaciers, would the frozen water from Enceladus, Titan, or the Moon, or Mars as frozen polar ice caps be drinkable to us? David - It’s probably got cometary volatiles in there as well, so it will have all these organic and carbon bearing molecules as well. Chris - They presumably haven’t tasted Cambridge tap water lately? David - But I have and it’s probably worse on the Moon. Titan is going to have methane and ethane tainting the ice. And Enceladus and Europa are going to be all kinds of salts and possibly magnesium sulphate, or epsom salts if it’s hydrated. So if you drink that water you’ll be trotting off to the loo quite soon. Chris - That’s true because magnesium sulphate is is a pro diarrheal, isn’t it? But there are these people in America, where fracking is going on, that have been able to set light to their tap water with methane and ethane coming up with the water. So I suppose they’re already used to this? David - Well possibly. But you can’t set fire to the water on Titan because there’s no oxygen from methane to burn with. Chris - And you couldn't open a nightclub on the Moon either because there’s not atmosphere. But more seriously, if we do go to Mars because one of the really important points that people make is we go to Mars and we’re going to have plenty of water because Mars was once very wet with loads of subsurface water. Could we just dig a hole, pull out some of that ice and drink it? David - You would want to purify it. Just evaporate it and recondense it - distill it basically. The purest form of water is distilled water - get some steam and condense it. Stuff is sold as glacier water and it’s got little bubbles of air that’s been trapped there since the ice age and it’s exotic, but I’m not sure. It depends what you mean by pure. Chris - There was a newspaper did a study a week or so ago. So it was a newspaper study, so obviously you’ve got to take this with a pinch of salt unlike what they’re saying about the water. 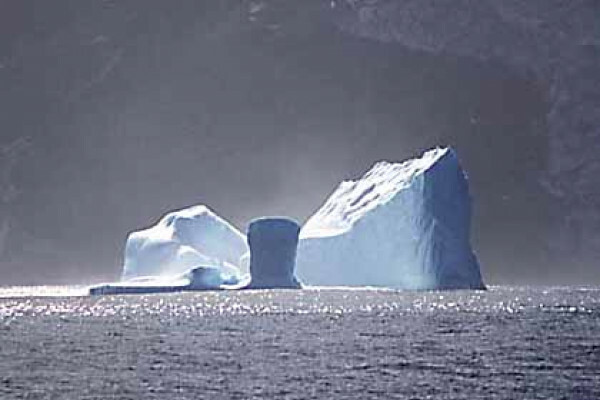 But they actually bought a whole range of these things off the shelf, some of these very high purity glacial and iceberg water and, of course, icebergs are often glaciers, aren't they? And just common or garden tap water. They asked a blinded panel of people to taste them all and they couldn’t tell the difference between the glacier water, some of which was retailing at hundreds of pounds a bottle, and there was no evidence that people could tell the difference between that and tap water. David - I’m sure if felt good though. If you knew you were drinking water that had come from Antarctica, it would have given you a buzz. Chris - And there was thousands of you, because the USP is that it’s thousands, if not millions of years old this water. I mean that’s got to affect the taste, hasn't it? I suppose the other question is that if you drink water on Mars, do you have to go to a Mars bar to drink it - Michael? David - Other chocolate bars are available. Michael - I just wanted to say with the water being millions of years old, most of the other water has been around a bit. It’s still probably has been water for quite a long time. Not in a glacier, but… When you get down to it it’s water that has been through several people and you drink it again is still as much water as water that’s been stuck in a glacier for that long. Previous What causes brain freeze? Next What does a black hole look like?